famous cities all over the world: Pisa. Miracles and the Leaning Tower. atmosphere of an Italian home with all the comforts of a hotel. on the fun of a vacation at the sea or at the spas. simply walking from the central train station. rentals of maximum 6 months. holiday in Tuscany even cheaper! restaurants, which will ensure an unforgettable holiday. area, a large bedroom and a bathroom. It can comfortably accommodate 4 people. basket with essential food items and local products. The bedroom can be arranged as a double bedroom or as a twin bedroom. Tower and of the Baptistery are visible behind the ancient city walls. board. The balcony overlooks a private courtyard and it is very quiet. and there you will be given all necessary information. Pisa and many other famous cities in Tuscany. location of the city outdoor market (open on Wednesday and Saturday). keep their rental bike indoors in the private staircase at street level. such as Florence, Lucca, Massa Carrara, Volterra and Siena. wonders of the world, which has become the symbol of the city. allow tourists to fly to Pisa at very reasonable prices. very easy access to beautiful cities, like Florence and Lucca. explore western, northern and central Tuscany. the sea only few kilometres from the city. Maritime Republics, together with Genoa, Amalfi and Venice. attention of people from all over the world. 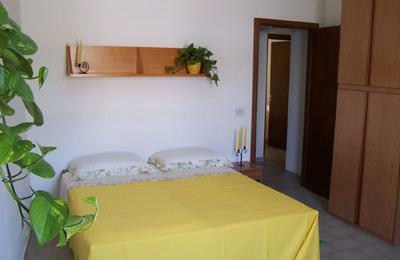 Prices for 1 or 2 people: 70 euros per night or 420 euros per week. Prices for 3 or 4 people: 80 euros per night or 450 euros per week. No smokers, pets accepted upon request. 50% reservation deposit, 50% upon arrival. price. Later than 45 days prior to arrival, 50% of total price.